It’s time to look at the benefits of minimally invasive tubal ligation. Women face many obstacles pursuing female sterilization. Unintended pregnancies due to failed birth control methods is high. Over 10,000 complaints have been filed with the FDA over Essure. In doctors’ offices across the United States women are frequently faced with obstacles when pursuing female sterilization. Compared to male sterilization, it is common for women requesting tubal ligation procedures to be told that they must wait for 30 days after signing a consent form, or, have a physician who is unwilling to perform the procedure altogether. For federally funded health insurance plans, the 30-day waiting period is a mandate. States have established their own regulations on waiting periods. However, due to the disparity in wait times from state to state, it is often easier for men to find a doctor willing to perform a vasectomy within a faster time frame. In New York, while men also have to wait for 30 days, in California, there is a mandatory waiting period of just 72 hours to have a vasectomy performed. Private insurance companies have separate requirements for their policyholders, all of which must be taken into account before any sterilization procedure can be performed, and physician practices have their own policies for performing these procedures. Age of the patient, lack of children, and the individual beliefs of the doctor can play a role in creating barriers to sterilization for both men and women. While the American College of Obstetrics and Gynecologists recommends that at the age of consent, a woman should be considered autonomous when it comes to making decisions about her body, they also recommend counseling from a practitioner to make sure that all of the options, risks and expectations are fully understood. According to UpToDate, between 2 and 20 percent of women regret their decision to undergo sterilization. The factor most strongly associated with regret is being less than 30 years old at the time of sterilization. The younger a woman is when she has a sterilization procedure, the more likely she is to regret that decision. The ethical dilemma for doctors is whether the decision being made will be the right decision for the patient in the long-term, and the procedure is considered by many physicians as a lifestyle surgery, rather than therapeutic. However, the medical professional’s training, and/or the limitations of the facility may also prove to be barriers for a sterilization procedure, leading many women to choose less safe sterilization options or other non-permanent birth control methods. These come with their own risks. Many women do not do well with a regimented schedule of taking medication, which can make the pill ineffective. Others cannot tolerate the hormone shifts well, and the side effects can include life-threatening blood clots, requiring these women to stop taking the medication altogether. In 2011–2013, 61.7% of the 60.9 million women aged 15–44 in the United States were currently using contraception. The most common contraceptive methods currently being used were the pill (16.0%), female sterilization (15.5%), male condoms (9.4%), and long-acting reversible contraceptives (7.2%).” Centers for Disease Control: Current Contraceptive Status Among Women Aged 15–44: United States, 2011–2013; Kimberly Daniels, Ph.D.; Jill Daugherty, Ph.D.; and Jo Jones, Ph.D.
Over the last decade, statistics show that nearly half of all births are unintended, and the rate of unintended pregnancies that occur due to failed birth control methods is high. “Of the 6.4 million pregnancies that occurred in the United States in 2001, 49% were unintended. Of these 3.1 million unintended pregnancies, 52% (1.6 million) occurred in women who were not using contraception during the month of conception, whereas the remaining 48% were contraceptive failures.” National Institutes of Health: Sterilization in the United States – Deborah Bartz, MD, MPH and James A. Greenberg. UpToDate describes surgical sterilization as “a safe, highly effective, permanent, and convenient form of contraception.” If performed by a highly skilled laparoscopic surgeon, recovery for women can have almost no down time. Minimally invasive procedures use smaller incisions, can be performed in an outpatient setting, and allow patients to return to their lives faster after the procedure with less pain. This option does not require insertion of a permanent medical device that has been shown to have severe side effects among thousands of women. The Essure® device is made of nickel-titanium coils encasing Polyethylene terephthalate fibers that are placed into each fallopian tube during a hysteroscopic procedure. The fallopian tubes are expected to scar over the coils, naturally resulting in a permanent blockage at the opening of the uterus. The procedure may be done in the doctor’s office or operating room and is done at a time other than after childbirth. It is often done with only local anesthesia, though sometimes sedation is also given. Doctors are trained how to place the coils, but not all have had success. There are more than 6,000 reports included in a June 2015 report from the Food and Drug Administration (FDA) Manufacture and User Device Experience (MAUDE) database that shows that in addition to the device breaking, doctors need better training on placement and understanding the potential risks. This is the most controversial of methods. 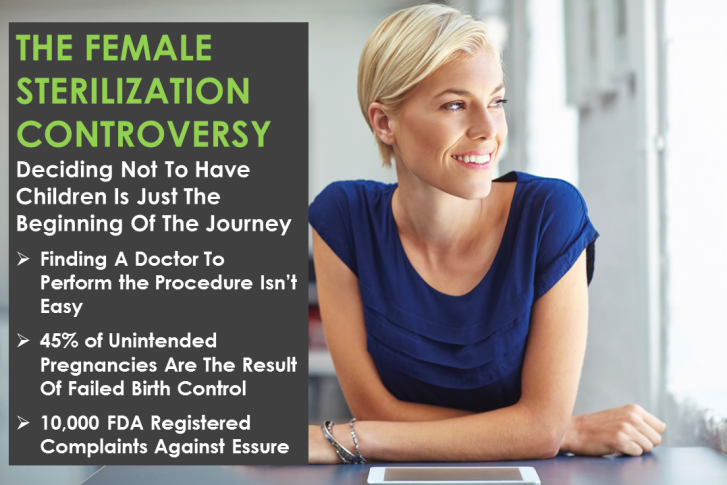 Essure became the standard of care in recent years, particularly for Planned Parenthood, because it can be placed in the patient in a non-surgical setting. However, over 10,000 complaints have been reported to the Food and Drug Administration by women who have had Essure coils, and the side effects and symptoms have extended well beyond the pelvic cavity. Nearly 30,000 women have joined Essure Problems, an online support network for women who have been negatively affected by the device. The list of Essure side effects reported on their website is in the hundreds, including hair and teeth loss, conditions related to gynecological, gastrointestinal, and neurological systems, as well as, autoimmune disorders, allergies, and more. The number of complaints filed with the FDA, and the collective outcry has led to the introduction of new legislation by Republican Congressman Mike Fitzpatrick from Pennsylvania, and Democratic Congresswoman Louise Slaughter from New York. On Wednesday June 8, 2016, Rep. Fitzpatrick announced the package of bills aimed at strengthening the FDA’s medical device review process and increasing accountability for dangerous products. Angie Firmalino, founder of Essure Problems spoke to the amount of hard work she and her thousands of members have put towards getting the bill introduced. Women who experience negative reactions to Essure need to have the coils removed by a specialist. Incorrect removal can cause permanent damage to reproductive organs, and increases the risk of needing additional surgery. Many women end up requiring a hysterectomy, salpingectomy (removal of fallopian tubes) or salpingo-oopherectomy (removal of fallopian tubes and ovaries). Depending on the location of the coils at the time of removal, it may be necessary to perform additional procedures. Having a laparoscopic hysterectomy, or other minimally invasive procedure performed by a fellowship trained specialist who is familiar with the risks gives patients better results. The Center for Innovative GYN Care (CIGC) surgical specialists can often see women sooner than other GYN practitioners because CIGC is focused entirely on minimally invasive GYN surgery. Each patient gets detailed, in depth attention from Natalya Danilyants, MD and Paul MacKoul, MD. This personalized care helps patients understand their condition and the recommended treatment so that they can have confidence from the very start. Our surgeons have performed over 20,000 GYN procedures and are constantly finding better ways to improve outcomes for patients. Offices are conveniently located throughout the Washington D.C. area in Rockville, MD, Reston, VA and Annapolis, MD. Women around the world who require tubal ligation, hysterectomy or Essure removal travel to CIGC from around the world through our travel program.